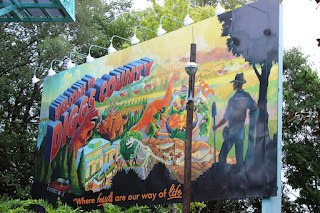 The balance in Diggs County between serious science and fun has long been a tenuous one. 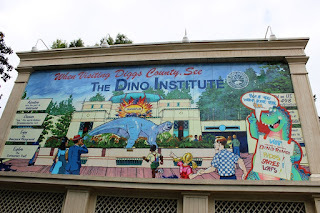 On one hand, you have The Dino Institute, installed in the county not long after the first fossils were found in this corner of Disney’s Animal Kingdom. On the other side, you have Chester and Hester, long-time residents that just want to make a living and have some fun while doing it. This dichotomy couldn’t be made any clearer than it is on the billboards scattered around the area. Let’s take a look at a pair that will show you just what I mean. This billboard was clearly erected by the folks over at The Dino Institute. While they once were a small ragtag group that occupied the lodge turned residents housing turned restaurant, they have since grown into themselves. The have clean environments, a quaint old wing feature traditional museum displays, and a research facility that is likely the envy of paleontologists everywhere. It has become a very professional environment where the most out of sorts element tends to be Dr. Grant Seeker’s ties and hand puppets. Turning our attention back to the billboard, we see that The Dino Institute has come up with four key phrases to market their attractions and get tourists through to pull off of the road. A road known as 498, aka the month and year Disney’s Animal Kingdom opened. The four words are: Adventure, Discover, Enjoy, and Explore. 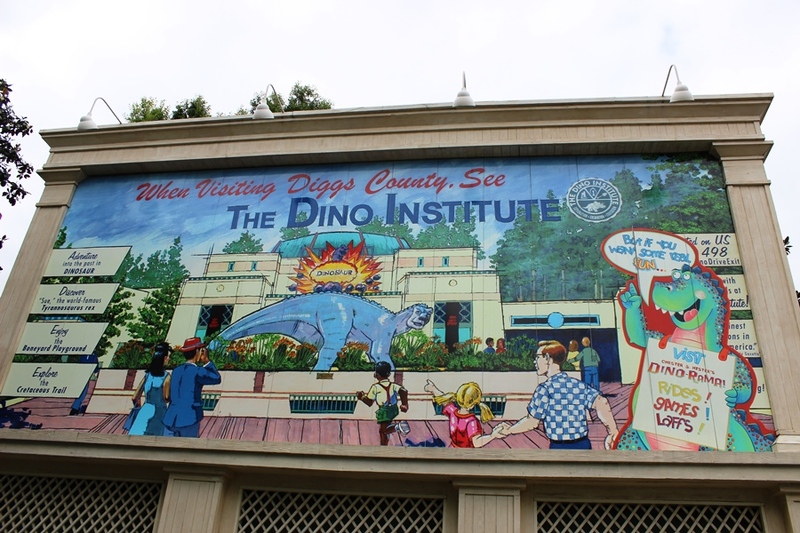 The artwork features several well put together families and friends, just to show us how family-friendly and important The Dino Institute really is. On the right side of the billboard we are supposed to see directions to The Dino Institute utilizing the Dino Drive exit and some quotes about how exciting the facilities are, including one quote from a Gazette (not this Gazette mind you) proclaiming that The Dino Institute is one of the finest attractions in America. Instead, however, someone has plastered over the sign with a cartoon dinosaur. It should come as no surprise that this poster comes from Chester and Hester to promote their roadside attraction, Dino-rama. What once was a gas station and its parking lot has become a full-fledged tourist destination. From fossilized finds and every plastic dinosaur you could imagine, to comics and magazines feature dinosaurs and even some kitschy folk-art dedicated to dinosaurs, this couple has truly bought in on the dinosaur craze that has taken over the county. Chester and Hester have set up multiple fair-type attractions and carnival games in their parking lot in order to further entice passerbys to stop and take part in the fun. Every dinosaur in the area is a caricature of itself, animated for maximum laughs, or should I say ‘laffs,’ as it is presented on their posting on The Dino Institute’s billboard. Chester and Hester make a clear distinction from the image that The Dino Institute exudes, and that is entirely on purpose. A second billboard in the area has clearly been created by the county itself or its chamber of commerce. Here we see an idyllic scene, reminiscent to me of the vistas from Lady and the Tramp, which highlights the community as a whole. There are houses, a church, and even an academic or government building across the river. In the foreground, however, we see a paleontologist on the hill overlooking the scene right next to a car, likely loaded up with a family of tourists, heading into Diggs County. For The Dino Institute we can see the museum, the Boneyard, and Sue the Tyrannosaurus rex. Meanwhile, Chester and Hester’s Dino-Rama is presented with its oversized icon, Primeval Whirl, and Triceratops Spin. What Diggs County knows is that both of these institutions are critical to their success and that if they both thrive, so too will the community. Dinosaurs live in a grey area of our hearts and minds, between the facts we have been given by scientists and the imaginative realm of what was or could still be. Diggs County lives within that grey area perfectly, balancing the science with the silly, as the billboards scattered about the land show us. I, for one, wouldn’t have my dinos any other way!